JACKSONVILLE, Fla. - Oct. 29, 2018 - PRLog -- North Florida Land Trust has acquired another important piece of property within a critical wildlife corridor surrounding Camp Blanding. The land conservation organization took possession of 2,300 acres located near Lawtey that connects Camp Blanding to Jennings State Forest. It is located within the Ocala to Osceola (O2O) wildlife corridor; a critical wildlife corridor that stretches from the Ocala National Forest to the Osceola National Forest. 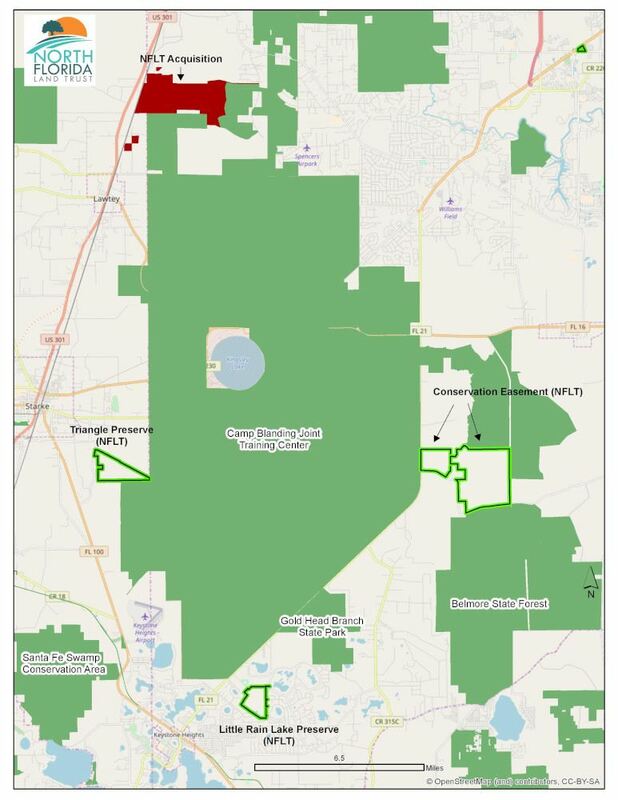 "This is our largest upland acquisition to date and important to protect for both its ecosystem benefits and for the buffer it provides for Camp Blanding," said Jim McCarthy, president of NFLT. "We have been working in partnership with Camp Blanding for a number of years to protect lands that provide crucial habitat for plants and wildlife and allow critical training for active and reserve troops and emergency responders. Since 2016, we have protected nearly 6,000 acres in partnership with the military." The 2,300 acres is comprised mostly of pine stands of various ages, hardwood forests and scattered mature pines along with excellent native groundcover. It is home to a variety of species including the threatened gopher tortoise, quail and other ground nesting birds. It also contains Boggy Branch, one of the headwater tributaries of the Black Creek watershed. NFLT will manage the property for forestry and wildlife, and practices such as prescribed burns will benefit populations of fire-dependent species like the gopher tortoise and Bachman's sparrow. NFLT has been focused on preserving land within the O2O corridor, which provides an important habitat for the Florida Black Bear and numerous endangered species including the red-cockaded woodpecker, indigo snakes and gopher tortoises. The organization is leading the O2O Wildlife Corridor Partnership, which is comprised of public and private organizations focused on improving land management and conservation within the O2O. The 80,000-acre Camp Blanding Joint Training Center is central to the O2O landscape and partnership. NFLT worked closely with the St. Johns River Water Management District and the Florida Department of Environmental Protection, Division of State Lands on this transaction. Funding for the project came through the Army Compatible Use Buffer program and a Florida Defense Support Task Force Grant of $385,000 via the Clay County Development Authority.